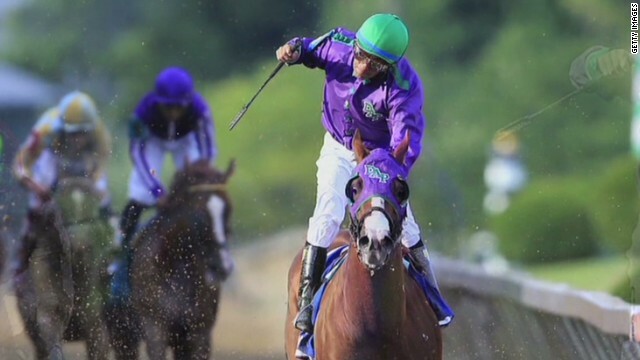 Update: Racehorse California Chrome is allowed to use a nasal strip at the Belmont Stakes, racing officials say. Trainer Art Sherman said California Chrome, who won the Kentucky Derby and Preakness Stakes, might be held from the race if the 3-year-old horse is not allowed to wear the strips across his nose that help improve breathing. When asked about a reported New York rule against it, Sherman said, "The horse has been on a six-race winning streak with nasal strips. I don't know why they would ban you from wearing one, but we'll have to cross that bridge when we get there, I guess." The New York State Gaming Commission, which regulates horse racing in the state, said the decision would be up to officials at the state's racing association. "Neither the New York State Gaming Commission nor the stewards at the New York Racing Association have received a request to use nasal strips in the June 7 Belmont Stakes," the commission said in a written statement. "If a request to use nasal strips is made, the decision on whether to permit them or not will be fully evaluated and determined by the stewards." In 2012, I'll Have Another also won the first two legs of the Triple Crown but his owners were told the nasal strips were prohibited in New York, several media outlets reported. The horse was unable to run because of a leg injury that ended the colt's career. Sherman said the decision would be up to co-owner Perry Martin. "He might not run if they say you can't run with a nasal strip. He's very funny about things like that," Sherman said. Nasal strips keep a horse's airway from becoming smaller during strenuous activity, the Flair Equine Nasal Strips website says. "By reducing airway resistance during exercise, Flair strips help prevent fatigue related injuries, help protect the lungs from injury and bleeding and promote optimal athletic performance," the site says.